Can The Mariners Be Baseball’s Version of the Clippers? Let me explain. Felix isn’t going to throw alley oops to Jesus Montero; Kendrys Morales isn’t going to get a never-ending highlight reel of clips for dunking on Ryan Dempster, and well you seem to get the point. According the hoopsstats.com, the Clippers’ bench was in the bottom five in the league in terms of points, rebounds, assists and field goal percentage last year. The Clippers needed to improve the bench to get better. Last offseason LA re-made their bench. They had 10 guys on the roster who weren’t regular starters last year. Only two of them are still on the team. The Clips main weakness was small forward depth, much like the Mariners lack of any power hitters. They went out and brought in Lamar Odom, Matt Barnes and Grant Hill among others. No one thought this would actually function and that the Clippers would struggle to give guys playing time, etc. But the Clippers have one of the better records in the league thanks to a bench that leads the league in bench scoring, and are in the top five in the league in rebounding, assists, steals and blocks. The Mariners, you’ll remember, needed a new batch of power hitters. Middle of the order guys. Guys who could actually hit home runs on a consistent basis. Seattle also wen the overkill route, dealing for Morales and Mike Morse as well as signing Raul Ibanez and Jason Bay. All of whom play some combination of the DH-First-Base-Left-Field Triple-platoon of positions all played by power hitters. The Mariners are not only protected in case of injuries (which always seem to happen at the most inopportune times,) but are also able to play the mix-and-match game. Eric Wedge can rotate Morse, Ibanez, Bay, Morales as well as incumbents Mike Carp and Justin Smoak through DH. He can also play all of them with the exception of Bay at first base, and all with the exception of Morales and Smoak in left field. It gives the M’s the flexibility to lean on the hotter bats as well as easing off the colder ones. So, can the M’s be baseball’s version of the Clippers? What do you think? Could the Mariners be baseball’s Clippers with a mix-and-matching, strong-in-the-bench squad? Well Known Piece: Spite: Why Again, is the Sonics’ History in OKC? Oh yeah, spite. That’s the answer, or at least that’s my take on it. You see, not only have we (Seattle) lost our team, but in a matter of years the Raiders are in the NBA Finals. So, not only does that irk me (that’s the PG version), but I should also point out that all of the Sonics’ history is owned by Clay Bennett and his “posse”. So, assuming you’re still following along after that painfully short lead-in, here is my perception: spite. Yes, spite. Why else would you want to take a team’s history? When Seattle gets a team back (looking at you Stern), I don’t want that team’s history. That’s their history; they accomplished it, and they deserve to have it. Say your team is gone along with its history. Say you’ve had some Hall of Fame worthy players as well. Now let’s say that those players’ jerseys were never retired and that the history, as stated, is owned by somebody else. Welcome to our world readers who aren’t Northwesterners and/or Sonics fans. Gary Payton’s jersey was never retired, and the ability to retire it now lies in the hands of Clay Bennett. And that’s what bugs me. Bennett isn’t going to retire the Glove’s jersey. Even if he did, GP has said he doesn’t want it retired in OKC. So basically, the jersey is useless in OKC’s hands. And that’s what bugs me. They know that they weren’t going to do anything with the jerseys of guys like Payton and Kemp, not to mention the 1979 NBA Championship Trophy. But they own the history nonetheless. Which seems spiteful to me. You’ll notice that I don’t refer to OKC as their actual nickname, and more accurately call them the Raiders. They are in fact just that, Raiders, who took the team and the history. A quick side slant at Bennett and Stern here. Stern named Bennett the head of the NBA Relocation Committee. That might be the worst hiring since the Knicks brought in Isaiah Thomas. Or maybe even worse. Another thing that is bothersome (again, being PG rated here) is that every time I watch the NBA playoffs, they throw out stats like “OKC’s first playoff (put accomplishment here) in over 15 or 20 years.” That’s also a load of bahooey (again PG), because it wasn’t OKC. It was the Sonics. And just to clear things up, I’ve got no ill will towards the Thunder players or coaches. Most of them weren’t in Seattle, but the people I do have a problem with are Bennett and his “posse”. King Me- The Sonics Are Back!!! The one day I don’t check any of my usual sports sites first thing in the morning is the day the Sonics are sold. Granted nothing is official. We are still awaiting an official announcement from the NBA Board of Governors on the approval of the sale. And then there is Kevin Johnson’s last-ditch effort that is the equivalent of a pitcher hitting with two outs, no on and down by one in the bottom of the ninth. There is an ice cube’s chance in hell it happens. That being Johnson convincing the Board to keep the team in Sacramento. They should move to Seattle, by the way, and that’s not just me being from Seattle, but also because the Hansen/Balmer/Nordstrom group is forking over nearly a billion dollars of their hard-earned money to bring a team here. Why would you deny that? I’m no NBA agent, but Seattle would be a really “cool” (a la Pete Carroll) landing spot for free agents. Not to mention all that Seattle-area talent might want to play at home. They could be Washington natives looking for a one-year deal and decide to play at home. Nate Robinson could fit that bill. Should Brandon Roy not have his contract guaranteed by the T-Wolves, he would fit. Jon Brockman is out there; maybe he regenerates some of that UW magic in a Sonics uniform. There is almost too much to get excited about. The team can finally retire Gary Payton’s jersey. Retire Shawn Kemp’s jersey. Definitely not retire Wally Walker’s. Kevin Calabro could come back. There are already talks of Phil Jackson joining the team in a “mentor” role. RC Buford (who has engineered the most underrated sports dynasty of all time in San Antonio) and Larry Bird are also being tossed around as potential front office names. We could bring back Nate McMillian, or if all else fails trade everyone not named Cousins, Robinson, Thomas and Brooks to Denver for George Karl. There are just so many opportunities. Seattle Center will have its most exciting tenant back (albeit for two or three years at most.) Plus, you know whenever those darn (wanted to use a different word there) Raiders come to town for the first time, the Sonics are going to beat them. It’s a given. 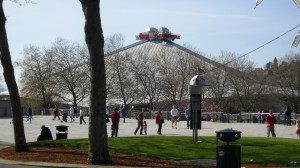 Key Arena: The Sonics soon to be temporary home. This just couldn’t have come at a better time. Put aside the fact that those darn (wanted to use another word, again) 49ers made it to the Super Bowl. Put aside the fact that UW, WSU, Gonzaga and Seattle University all lost by 10 points or less over the weekend. Put aside the fact that it could have been the Seahawks in the Super Bowl (you know we would have beaten Squidward and friends.) Put aside it all for a moment. Everyone got their hearts ripped out Sunday. The Seahawks lost a really tough game. I’ll admit, I thought the game was at one o’clock in my time zone. I didn’t realize it was on until I saw a tweet about “a nice throw” by Russell Wilson. A couple minutes and choice-y swear words later I turned on the TV to see Wilson score on a rushing touchdown to cut it to a 13-point game. Obviously you know the rest. We lost to Atlanta, but there are a ton of things to take from this. Maybe it isn’t the end of the world. Pete Carroll had 15 wins (counting the playoffs) in his first two years. He had 13 this year (again counting playoffs) alone. He had 19 losses over that span (first two years) and less than a third of that number (six, again, counting playoffs) this year. This is a tremendous step up for Carroll and the team. It finally seems like he has the personnel he wants to run the kind of team he needs to win. And he is winning. The Seahawks have nothing to be ashamed about this year. Yes, they lost and that was heart breaking, but I think most people thought this would be another 7-9 transition year with Matt Flynn as Tavaris Jackson 2.0 in terms of place-holding for the TBD “franchise QB.” But we found Wilson; we found an elite defense (Seriously, best in the league. Period.) We found a lot of things to be proud of this year that might not have shown themselves in a few more years instead. The Seahawks are completely ahead of the curve, and they should be a Super Bowl contender for at least a decade. Count on it. The Seahawks’ price of admission: moving down two rounds from the fifth round to the seventh. Brandon Browner is widely perceived as one of the better, if not physical, cornerbacks in the entire league. He’s a highly penalized player at times, but consistently draws one of the opposing team’s top threats and comes out either on top or close to it. Browner also made the Pro Bowl last year and probably would have this year if it weren’t for his four-game suspension. Seahawks’ price of admission: paying his contract. They signed out of the CFL, where, to his credit, he was a three-time All-Star. Carroll and Schneider have also found a countless number of contributors in all portions of the NFL Draft. Bobby Wagner was originally touted as too small to play linebacker in the NFL. He led the top scoring defense in the league in tackles his rookie year. KJ Wright was a fourth-round choice who has gradually turned into one of the better young linebackers in the league. He’s shown his versatility on defense, starting at both the middle and outside linebacker spots at certain points in his career. Kam Chancellor might be one of, if not the best find of the bunch. Towering over opponents (unless of course, Randy Johnson was to suit up) in the defensive backfield, Chancellor is one of the harder hitters in the league and makes you think twice about leaping for a catch in his vicinity. He also went to the Pro Bowl last year. Draft slot 133rd overall. That’s in the fifth round for anyone who isn’t a super draft genius. Richard Sherman might be the best cornerback in the the league. Period. The Hawks found him in the fifth round. And of course there is Russell Wilson who not only tied Peyton Manning’s NFL Rookie record for most touchdown passes in a season with 26, but also was the first rookie QB since the merger to go undefeated at home. The Seahawks’ brass has also found countless gems in the even-later stages of the draft, JR Sweezey, Greg Scruggs, Jeron Johnson and Jeremy Lane all have made impacts at times. One of the things that makes the Seahawks’ front office tandem special is because of something they didn’t do. They could have easily tried to replicate Carroll’s USC success and go get every USC guy on the open market. While the team might have been good, it would have seemed too easy or just not right at all. Before you would have known it, USC North signs and the like would probably be popping up everywhere here to Omak. But they did pick and choose their moments with USC players. After all, they probably would have the best scouting report in the league. Malcolm Smith looks like a long-term answer at linebacker as well as Anthony McCoy, who looks to be also in the team’s long-term plans. McCoy was low on draft boards due to off-the-field problems. Talent wise it was there, maybe not off the field. He’s doing great in Seattle with Carroll and looks to, as stated, be with the team for the long haul. The one name we have forgotten to mention is Marshawn Lynch’s. You can’t forget beast mode. The Seahawks probably wouldn’t be as far along as they are now without Lynch. He was stolen from the Bills for a couple of mid-round draft picks. Pete Carroll and John Schneider have done an outstanding job. It certainly makes you forget about the down year we had with Jim Mora. If I missed any late-round gems, or other great acquisitions the Seahawks made, tell me about it in the acquisitions. This is what the signs that are draped over every overpass on I-5 in Seattle read. The Mariners need offensive help and apparently Justin Upton is not interested. The M’s supposedly agreed to send shortstop Nick Franklin, relievers Charlie Furbush, Stephen Pryor and one of the pitching prospect trifecta of Taijuan Walker, Danny Hultzen or James Paxton. Probably Walker. Yes, all three are likely going to be starters in the Majors, but they all could be aces. I’m not overvaluing Upton or anything, but the asking price should be higher than stated for a few reasons. He’s young. He has the potential to be a dynamo offensive player, and Seattle is so very desperate for offense. We’re talking David-Stern-desperate-for-power-and-control desperate. On the flip side of that is the fact that the Mariners could have potentially stolen Upton for cheap. Arizona probably should have asked more for Upton, but Seattle was going in not giving up too much in reality. Yes, Franklin could be special, but the M’s would have gotten a special player back in Upton. Yes, one of the “trifecta” could be special as well, but so could the other two. And if you haven’t noticed, the Mariners are starting to develop a very “Oakland A’s” kind of feel to them in terms of developing good relievers, so losing two wouldn’t be horrible. Can you imagine the Mariners’ offense had he accepted the trade? Upton, Morales, Seager and Montero are a pretty fantastic middle of the order. Add in Raul Ibanez, Dustin Ackley and a possible resurgent Franklin Gutierrez and you have the makings of a legitimate offensive team. Something we haven’t seen in Seattle in a very long time. It is disappointing that the trade for Upton didn’t work out, but the big positive here is that the Mariners know that they have a package of players that would have acquired one of the premier players in the game. If that group of players could have brought in Upton, then they can certainly bring in someone else of his caliber. What do you think about all this? Was Upton smart to stay in Arizona? Should the Mariners go after another player of his caliber?